AC101 is a smart and easy-to-use Ethernet access controller that can be fitted to two doors. 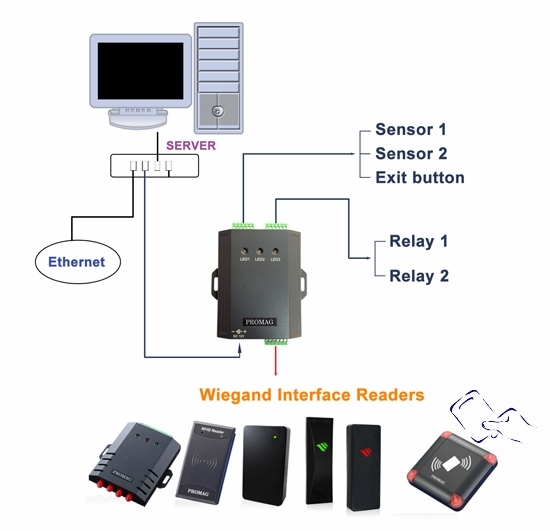 It is able to connect any kind of Wiegand reader in the market, such as magnetic stripe reader, RFID reader or fingerprint reader. There is Utility software for user to change settings of the device through over the network. Via TCP/IP protocol, you also can set some configuration, the filter list of person, and time-zone management. Also you can get door access record by Ethernet too. With the network-enabled access, it gives the advantages of central control, and viewing the event log reports easily. - Supports 2 Wiegand readers and 2 doors access management. - Time zone management for every person.